I was learning how to make Dorcet style buttons yesterday and today. My reference books for learning were "50 Heirloom Buttons to Make" by Nancy Nehring. 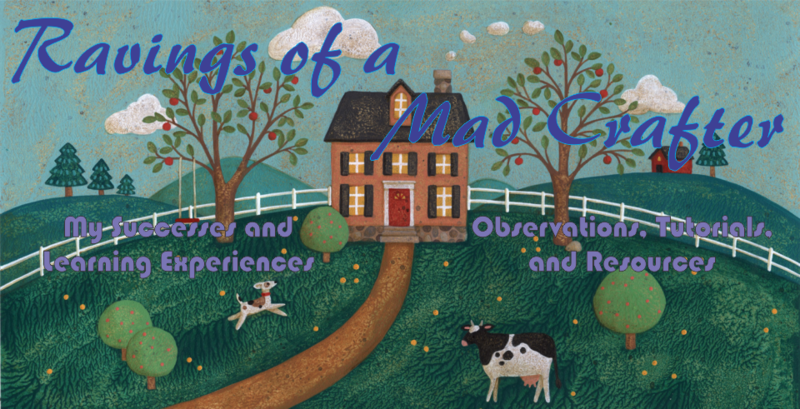 A great book with lots of button types and histories. Also used was "The Button Maker" by Sarah Beaman. "The Button Maker" has good illustrations and instructions. I find that the two books are very complimentary. I highly recommend both books. Dorcet buttons are made of fabric with rings that help them keep their shape. They are basically a yo-yo that has a ring inserted and then the yo-yo is closed. The Singleton button is made the same way but has an added backstitch around the inside of the ring to keep the ring from moving. 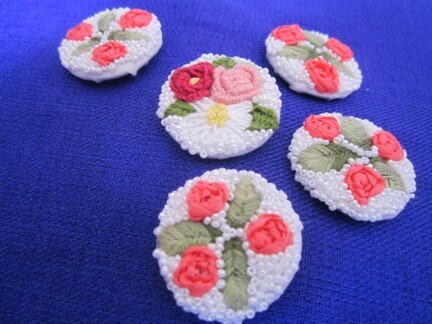 Singleton buttons were made by the Singleton family and were embroidered with daisies according to Sarah Beaman's book. To make Dorcet buttons start with deciding what size to make them. I decided on using 1 inch plastic rings for the sample. Both authors suggest the outer size of the button fabric be 2.5 times the size of the ring. The fabric should be a closely woven fabric but not to thick. If there is any chance that the fabric may shrink when washed, please prewash it. In the sample I used a silk taffeta. I wanted to embroider mine so I drew two circles, one a 2.5 inch circle and then another 1 inch circle in the center. 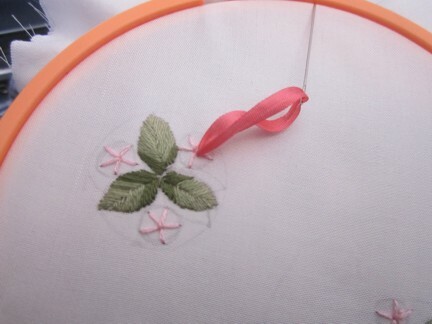 So with my taffeta fabric marked and in a hoop I embroidered three leaves in a kind of Celtic design. 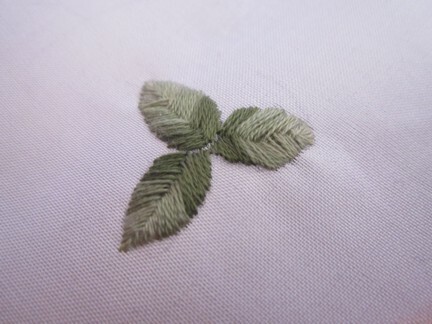 The leaves were stitched in herringbone using three shades of green cotton floss. Then I decided to make spider roses using 4mm pink silk ribbon. Spider roses are very delicate not the best choice for buttons, but I am not making these washable. Be sure to read the limitations on the fabrics, rings, threads and ribbons you use. 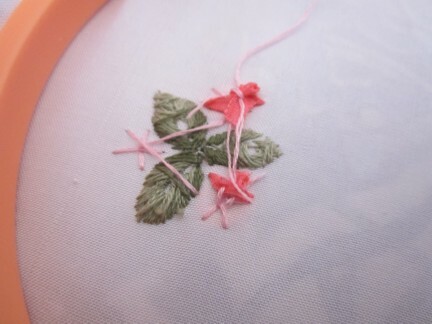 Green embroidered leaves for button. 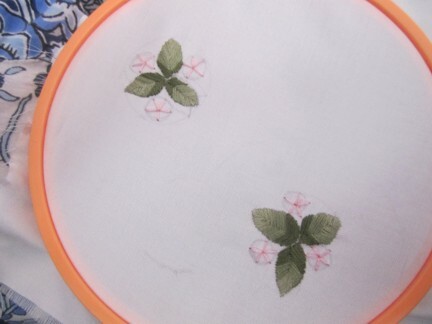 Embroidered leaves and Spider Roses. To make a spider rose draw a circle a bit smaller then you want the rose to be. 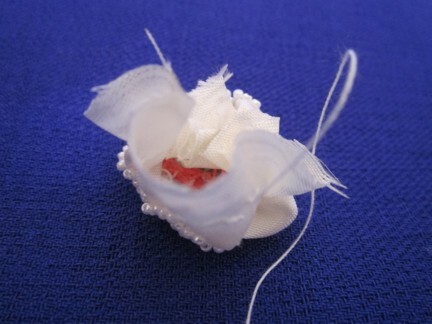 Then from the center of the circle fasten a thread matching the ribbon color. I wouldn't use a standard knot because it might show. I make a stitch and then pierce though it with the needle to lock it in place. 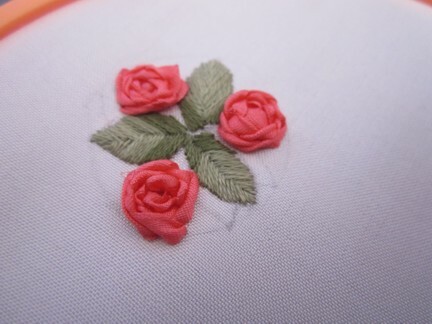 Next use a long stitch and stitch from the center of the rose to it's edge. Repeat this remembering that you need an odd number of stitches and try to make them evenly spaced. The long stitches form the web for the spider rose. Spider webs stitched as first step of making a spider rose. Now for some fun! 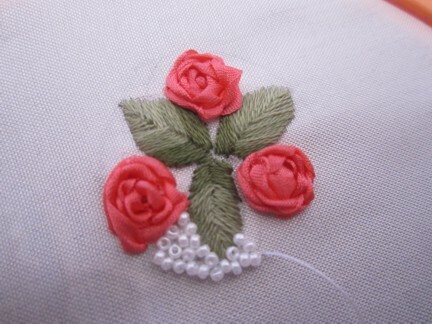 Sometimes I start by sewing a tiny 3 mm crystal in the roses center. But this time I will just make a standard rose. 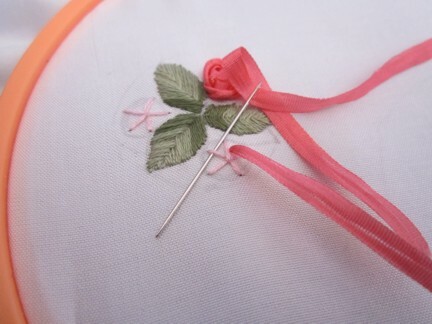 Thread a small tapestry needle with the 12 to 14 inches of 3mm silk ribbon and bring it through the fabric near the center of the rose. Remember that the silk is delicate and will start fraying if to long a piece is used. Pull the ribbon through the fabric leaving a small tail. Silk ribbon brought up near center of spider rose web. Weaving started, beginning of spider ribbon rose. Spider ribbon rose partially woven. Twirling ribbon to create more realistic petals. Then weave the ribbon over and under the web threads. 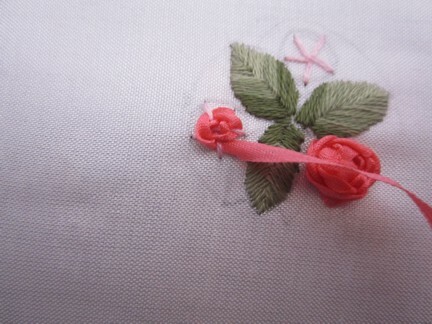 This is done very gently, if you pull the ribbon to tight it will not make a pretty rose. Once the center is woven you can twirl the needle curling the ribbon. The curled ribbon makes interesting petal shapes and makes the rose more roselike. Then straighten the ribbon for the last round of weaving. 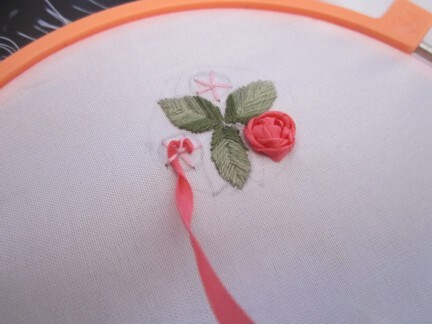 Sometimes if the rose is uneven I will stitch a petal or two around it. Sewing the ribbon ends to secure them to the back of the embroidery. Then pull the ribbon back through the fabric. Clip both ends of the ribbon and sew them together using the web thread. 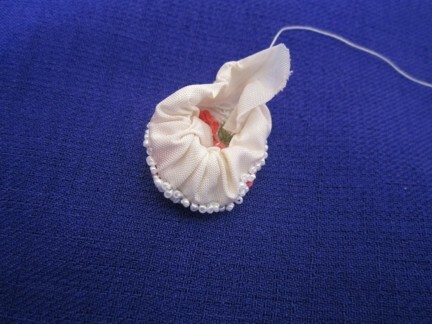 There are other ways to do this but I like the security of sewing the ends. 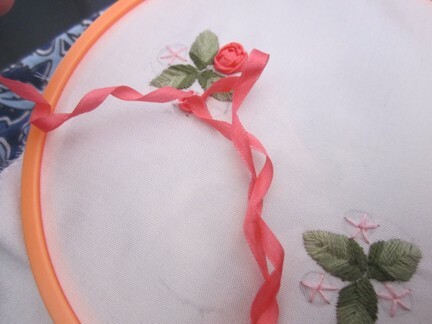 Sometimes I stitch into the ribbon roses very gently just to secure the petals. 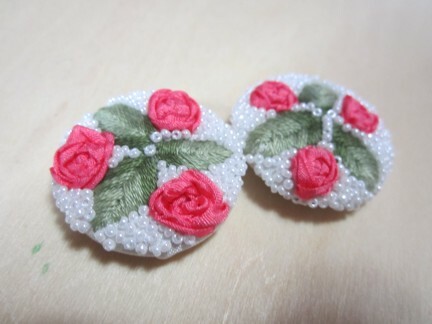 It is a bit tricky not to leave a stitch showing but it makes the roses more durable. It also gives an opportunity to shape the spider rose. 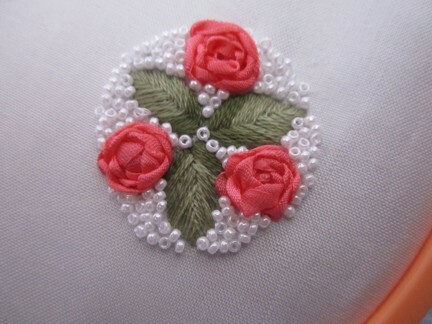 Finally I decided to stitch some rocailles beads one at a time around the embroidery and within the 1 inch circle. The button remind me of little tiles. Stitching the beads on using silk beading thread. With the embroidery finished now comes the button making. I was a bit worried at this point because I was unsure that all the beads were inside the 1 inch circle. Now instead of cutting the fabric at the 2.5 inch circle I decided to try something different. I took the small yo-yo maker by Clover and placed the top piece over the embroidery. Embroidery seen through the top part of a Clover yo-yo tool. This turned out to be trickier then I though it would be. 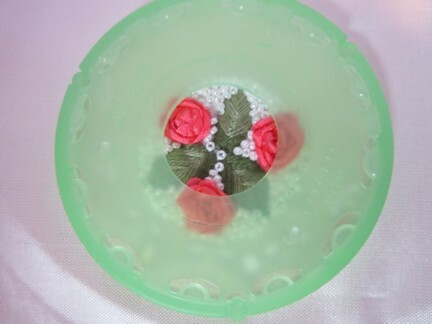 The ribbon roses crush easily and the beads were slippery. But I gave it a try and cut around the yo-yo tool leaving about a 1/4 inch of fabric beyond the tool. Then I put Stop Fraying by Aleene's on the edges of the silk and let it dry. 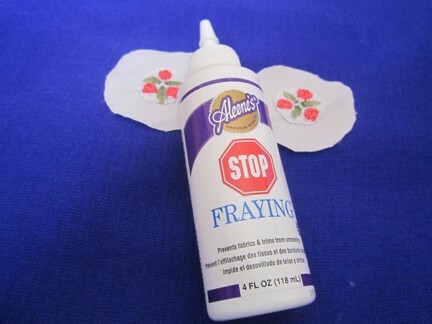 Stop fraying was put on the edges of the button rounds. After the fabric dried, I tried to but the yo-yo tool on but the embroidery was to thick. So I held the two parts together gently and stitched around the yo-yo tool. It was a bit hard to do because the tool kept slipping. But it came out great because I was extremely gentle. Using the yo-yo tool should work better with a less delicate and 3D embroidery. 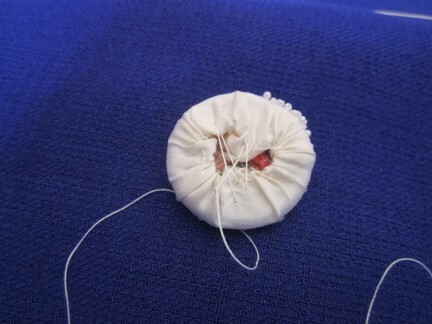 To form the button without a yo-yo tool stitch a running stitch around the fabric circle about 1/4 of the depth from the edge. The trick here is to leave enough fabric to push under to secure the edges. But also to leave enough fabric to close the fabric circle. You may need to run the gathering thread a couple of times to get it right. Remember to place the 1 inch plastic ring inside the button before closing it tightly. Pulling the running thread to form the button. After pulling the yo-yo closed, making sure the fabric edges were tucked inside as well as the 1 inch plastic ring. The trick is to pull the thread and then loosen the gathering and spacing the fabric evenly. Finally I ran the thread around the close for extra strength. If there is still an opening you can run stitches from top to bottom and side to side. If there is still a whole or you want a neater back, stitch a piece of fabric over the opening. Running another gathering thread to help tighten the button opening. 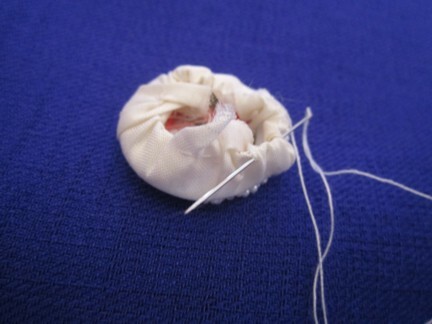 To use the button simply sew through the button onto the garment. Another way to attach the button is to use a button safety pin. I hope that this will inspire and help with making fun and unique buttons.